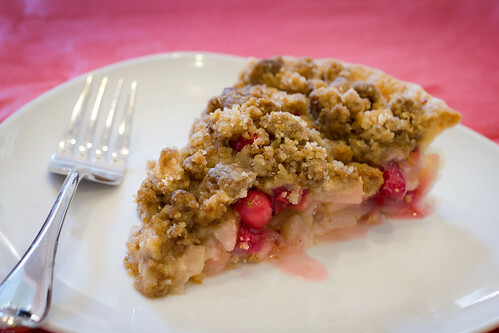 This week's Sweet Melissa Sundays (SMS) recipe was chosen by Dawn of Growing Up and Getting Healthy After 40: Pear Cranberry Pie with Gingersnap Crumble. I love baked pears, almost as much as I love baked apples... so this recipe was right up my alley! I even still had frozen cranberries leftover from last Thanksgiving so I was able to use them in this recipe. I used d'Anjou pears instead of Bosc pears (not sure if it matters?) and limes instead of lemons, but otherwise followed the recipe exactly. I found that putting the pie dish on the baking sheet resulted in an underbaked pie crust, so if you make this pie I would recommend putting it directly on the oven rack and then simply putting a piece of foil on the rack below it to catch any messy drippings should your pie bubble over. The filling was good, but admittedly very tart. I used lime juice instead of lemon juice in the recipe, but I think what accounted for the majority of the tartness in this recipe was the cranberries. We all enjoyed the sweet and tart combo, but those who don't like a tart dessert will probably want to shy away from this one. I also found the filling to be very runny, though it was much better the next day after the crust had some time to soak up some of the juices. I might use Dorie's trick next time and sprinkle a bread crumb/ground nut mix on the crust before adding the filling to help soak up some of the juices. Thanks Dawn, for hosting this week. If you'd like the recipe, you can find it here. 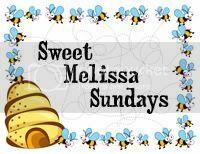 Make sure you check out the Sweet Melissa Sundays Blog Roll to see how everyone else enjoyed this very tart treat! Also don't forget to enter my giveaway here before it ends on June 24th. - Don't bake your pie on a baking sheet. Instead, simply place a large piece of foil on the rack below the pie to catch any drippings should the juices from the pie bubble over during baking. - If the crumble starts to brown too quickly, you can cover the pie loosely with a foil tent while the rest of the pie finishes baking. Your pie looks great. I agree the crumble didn't look as appealing as it tasted. How funny your 18 month old thought it was ground beef! I can totally see it. LOL. My pie was a little too sweet, thought my berries were slightly tart, I would like to try it with cranberries next time. I sat out this week, but I loved baked pears too so I do eventually want to make this one. Thanks for your tips, they'll definitely come in handy (especially since I'm not a fan of tart desserts). Your pie looks awesome. If I didn't have some leftover in my fridge, this would be enough to get me to make it again. Thanks for the tip on what to do with a runny filling...I thought it was just me because of the raspberries. Lol to the beef comment- and your pie looks great. I'll be trying this recipe out sometime in the future. Thanks for the insight into how to soak up some of the juicy goodness of the fruit. I am always of the camp that I care much more what it tastes like than how it looks. I, too, had cranberries in the freezer. Wish I would have had time to make this!